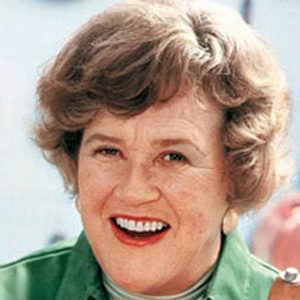 The beloved Julia Child really needs no introduction, but we thought it couldn’t hurt to share a brief history. Child (née McWilliams) was born in Pasadena, CA, graduated from Smith College and worked for the OSS during World War II in Ceylon and China, where she met Paul Child. After they married, they moved to Paris, where she studied at Le Cordon Bleu and taught cooking with Simone Beck and Louisette Bertholle, with whom she wrote Mastering the Art of French Cooking. After they returned to the states, Boston’s WGBH launched The French Chef television series, which made her a national celebrity, earning her the Peabody Award in 1965, an Emmy in 1966, and a place in our hearts forever. Julia Child didn’t mess around when it came to breakfast. Here her velvety hollandaise sauce is spooned over poached eggs, ham, and brioche, to marvelous effect. Coq au vin, aka chicken soused in wine, is a French classic that exists in countless incarnations. This rich, soulful riff is from Julia Child.